But that's not the case this year . 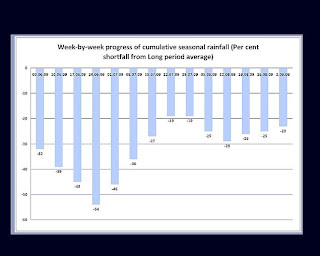 As u can see from the pic already we are running a 40 % deficit rainfall on a average if this is going to continue for next couple of weeks. Then i guess output of the kharif crop which is major crop in year is going to decrease drastically , which will lead to scarcity of rice . are facing the drought situation. If that is the case then it will lead to shorting in supply side..which will lead into high pirces in coming days. Where is market heading ?